The 11th Indian Premier League kicks off on Saturday, April 7. The IPL has produced many, many, memorable moments on the way. The first century in the IPL was scored in the inaugural edition in Bengaluru by Brendon McCullum for the Kolkata Knight Riders against the Royal Challengers Bangalore. 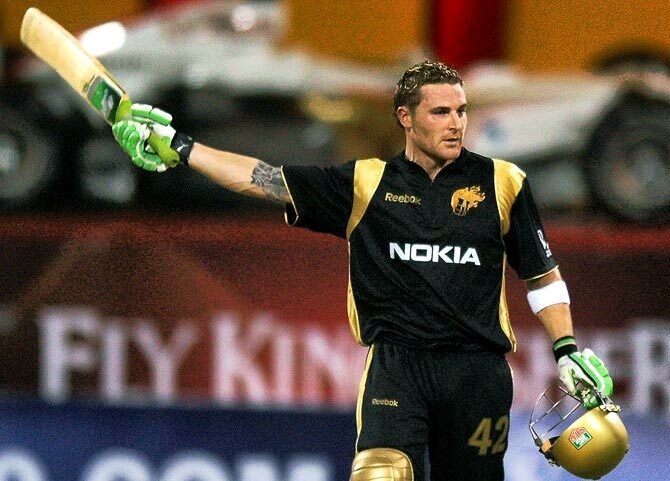 McCullum hit an unbeaten 158 from just 73 balls in the first-ever IPL game, helping KKR crush RCB by 140 runs. Manish Pandey is the first Indian to hit a century in the IPL. Manish scored an unbeaten 114 off 73 balls for RCB against the Deccan Chargers in the second IPL in 2009. Sohail Tanvir's 6/14 for the Rajasthan Royals against the Chennai Super Kings at Jaipur on May 4, 2008 was the first five-wicket haul. Balaji also registered the first hat-trick of the IPL. The first Super Over took place between KKR and the Rajsthan Royals in the second IPL season. Rajasthan Royals scored 150/6. In reply, KKR tied the score off the final ball of the innings. The dubious record is in the name of RCB's Balachandra Akhil in the inaugural game against KKR. It all happened on the 50th ball of the RCB innings. The wicket was bagged by Ajit Agarkar, caught by Ricky Ponting. Rajasthan Royals's stupendous run from underdogs to winning the title in the inaugural IPL stands out. Led by spin legend Shane Warne, the Royals beat CSK by 3 wickets (and off the last ball) in the final at the D Y Patil stadium in Mumbai. 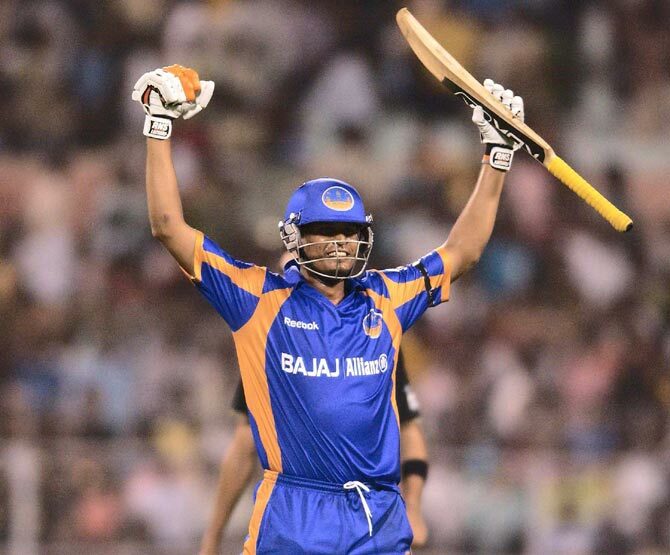 Chasing 164, Rajasthan began on a disastrous note, losing 3 wickets inside 7 overs with just 42 runs on the board. First run: Sourav Ganguly off the first ball in the IPL, a leg bye. First run by a batsman: 4 by Brendon McCullum off the 8th legal delivery of the match bowled by Zaheer Khan (3 extras -- 2 leg byes and one wide -- were scored before the first run off the bat). First 4: McCullum off Zaheer Khan. First 6: McCullum off Zaheer. First batsman dismissed: Ganguly (caught by Jacques Kallis off Zaheer). First golden duck: Chaminda Vaas (caught by Sourav Ganguly off Ajit Agarkar) in match 4 (Deccan Chargers vs KKR). First free hit faced: Matthew Hayden (bowler Brett Lee) in match 2 (CSK vs Kings XI). Hayden was bowled off an inside edge, but it did not matter. First delivery: Praveen Kumar to Sourav Ganguly. First wicket: Zaheer dismissed Sourav Ganguly. First maiden: Glenn McGrath in match 3 (Delhi Daredevils vs Rajasthan Royals (a wicket-maiden!). First 100-run partnership: Gautam Gambhir and Shikhar Dhawan (added 112* runs for the second wicket) in match 3 (Delhi Daredevils vs Rajasthan Royals) in 2008. First 200-run partnership: Adam Gilchrist and Shaun Marsh (added 206 runs for the second wicket) in match 63 (Kings XI Punjab vs RCB) in the 2011 edition. First catch: Jacques Kallis to dismiss Sourav Ganguly, RCB vs KKR. First run-out: Ajit Agarkar/Wriddhiman Saha to dismiss Ashley Noffke. KKR vs RCB in 2008. First run-out (direct): Zaheer to dismiss Sanath Jayasuriya in match 5 (RCB vs Mumbai Indians) in 2008. First man of the match: Brendon McCullum. First player of the tournament: Shane Watson. First Orange Cap (for most runs): Shaun Marsh. First Rising Star Award: Shreevats Goswami (Royal Challengers Bangalore). Why will the IPL not be telecast on Star Sports First?